Mmm, the sweet taste of free. Pillars of Eternity is superb, but even after a bit of polish, some rough edges remain. Obsidian hopes to buff out the remaining blemishes with the arrival of The White March Part 2 on February 16—a free update for all players will accompany the launch. Pillars' massive spellbooks make for excellent tactical combat, but the combat UI itself is arcane. Patch 3.0 clarifies things by more clearly dividing per-rest and per-encounter abilities. More flashy, the whole third act has been revised to cut down the legions of trash while making things harder overall, an oh-so-welcome change for anyone who indulges in side-quests for time to time and soaks up extra XP. And that's in addition to new level-scaling options. The risks associated with combat can be jacked up too thanks to knockout injuries, making an iron man run still more terrifying. If a companion goes down in a fight they take an injury that will only be cured with good ol' R&R. 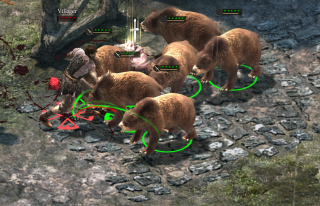 No word yet on the balance of all-bear warbands. If that idea makes your stomach turn, Story Time mode will allow you to waltz through the adventure and soak up the atmosphere without fear, while Athletics and Survival skills have been made less meh. The former grants a new self-heal, while Survival opens up multiple camping bonuses. And what RPG is complete without player housing? Even with a 15-floor mega-dungeon in its foundations, your Stronghold was a touch underused. Now, adventurers will have extra stories and rewards, travellers swing by with dilemmas requiring your input and a full quest line will test your claim to the castle itself. We consider Pillars of Eternity to be a champion among cRPGs, and nothing makes me happier than to see the devs tending it still.